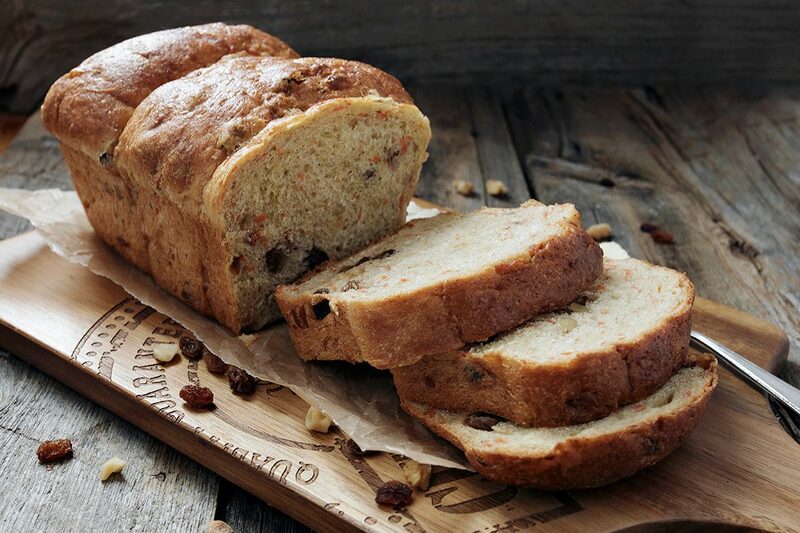 This lovely Carrot Raisin Walnut Yeast Bread is cinnamon raisin bread meets carrot cake! Delicious eaten out of hand, toasted or use the left-overs for delicious french toast! 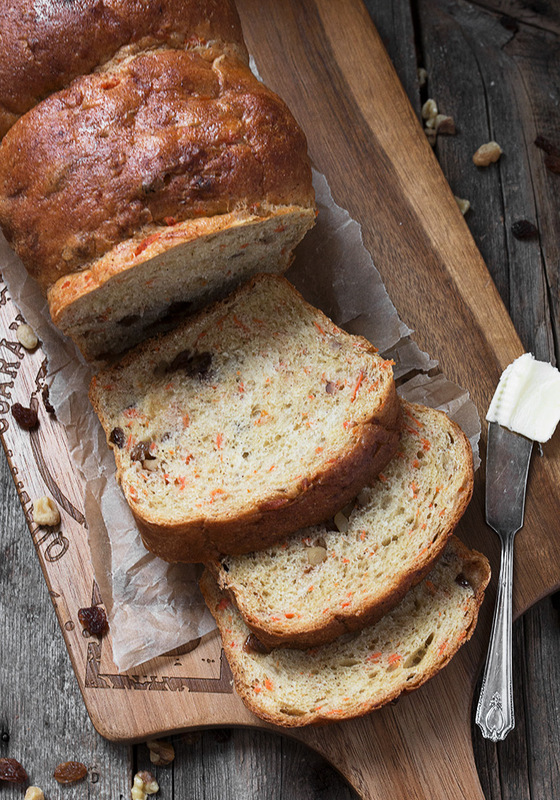 If cinnamon raisin bread and carrot cake had a love child, it would be this bread! 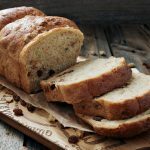 With lots of carrot, raisins and walnuts and a good dose of cinnamon, this bread is a treat, whether enjoyed with just a smear of butter or toasted to enhance all the great flavours. 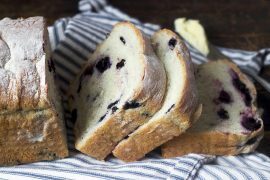 This would be a lovely bread to have sitting on the counter over the Easter holiday, handy for anyone to grab a slice or toast up for breakfast. And as it makes two loaves, you will have an extra to send home with guests or as a lovely Easter gift for someone. Perhaps the best thing about this bread is the delicious things you can turn it in to! 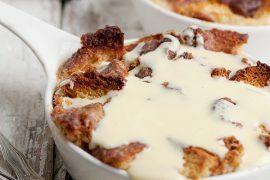 See the Cook’s Notes below for how to use this bread for French Toast or Bread Pudding Muffins! French Toast: Turn this lovely bread in to the most delicious French Toast ever! Simply mix together 1/2 cup milk and 1 egg for every 2 slices of French toast that want to make. Add nice thick slices to the mixture and let stand several minutes, turning once or twice. 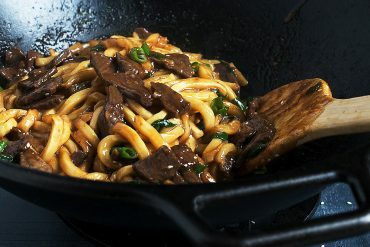 Cook in a non-stick skillet over medium heat until golden on both sides. Enjoy with some maple syrup. Bread Pudding Muffins: For delicious Bread Pudding Muffins, start with 4 thick slices of this Carrot Bread and cut in to cubes. Add to a bowl with 2 large eggs, 3 Tbsp sugar and 1 cup half and half (10%) cream. Allow to stand 30 minutes, then spoon 1/2 cup in to each muffin tin cup, pouring any remaining liquid over-top. Bake in 325F. oven for 40-45 minutes. Serve warm with a drizzle of maple syrup. 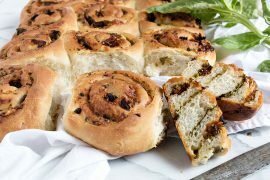 A delicious yeast bread, with carrot, raisins and walnuts. 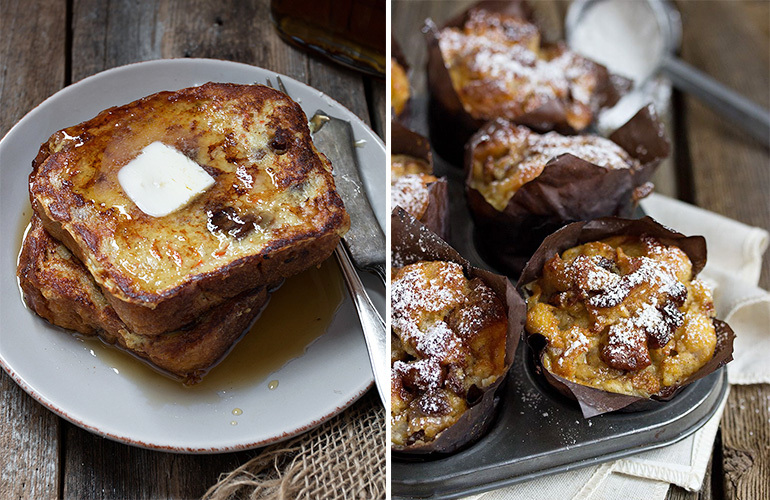 Great eaten out of hand, toasted or use left-overs for delicious french toast! Makes 2 loaves. Grease two 8x4-inch loaf pans. Set aside. Cook the carrots in a pot of boiling water until just fork tender, about 5 minutes. Drain and immediately rinse with cold water to stop the cooking. Using a box grater, grate the carrots and measure out 2 cups. In a large bowl or the bowl of a stand mixer fitted with a kneading hook, combine warm water and yeast. Stir and let stand a few minutes. Stir in the carrots, sugar, salt, oil, cinnamon, orange zest and 5 cups of the flour. Mix with kneading hook until dough is moistened. Knead with kneading hook for 8-10 minutes, adding more flour as necessary until you have a soft, moist dough. Remove dough to a floured surface and form dough in to a ball. Cover with a floured, clean towel and let rest 30 minutes. Gently deflate the dough and pat out in to a thick rectangle. Sprinkle with plumped and dried raisins and walnuts. Form dough in to a ball again, cover with floured towel and let rise a further 30 minutes, or until almost doubled. Turn the dough out on to a floured surface and divide in to 6 equal portions. Form the portions in to small balls. Add 3 balls to each of your two prepared loaf pans. 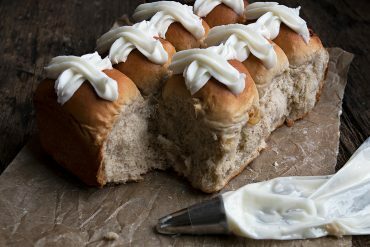 Brush the tops with melted butter and sprinkle with sugar and cinnamon. Cover with floured towel or greased plastic wrap and allow to rise for 30-45 minutes or until almost doubled. Preheat oven to 350F. Bake in preheated oven for 35-40 minutes or until bread is golden. 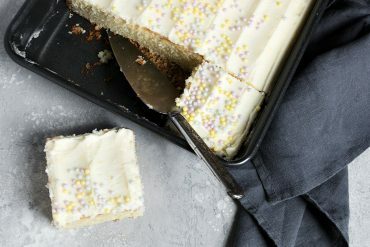 Let cool in pans on a cooling rack for 10 minutes before removing from pans and allowing to cool completely before slicing. To plump raisins: Place raisins in a bowl. Cover completely with hot water and let stand 15 minutes. Drain and pat dry. To toast walnuts: Add walnuts to a skillet. Cook over medium heat, stirring constantly, until fragrant, about 5 minutes. This bread was adapted from Marci Goldman’s A Passion for Baking. 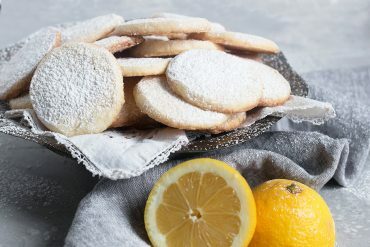 Jennifer, as a newbie to your blog, I am seriously blown away, just like Robyn, and can’t wait to try some of your recipes, especially this one. I am so bogged down with sewing projects for Christmas, that it will have to wait a couple of weeks for me to do some baking, my 2nd. favorite addiction. With 10 great grandbabies and #11 due in April, I do a lot of sewing, trying to make a dent in my enormous stash. Thanks Sylvia and my gosh, you do have your hands full! This one will be a treat all Winter long, so it will definitely wait on you :) Enjoy! This bread is something I would devour and as a French toast? Wow! 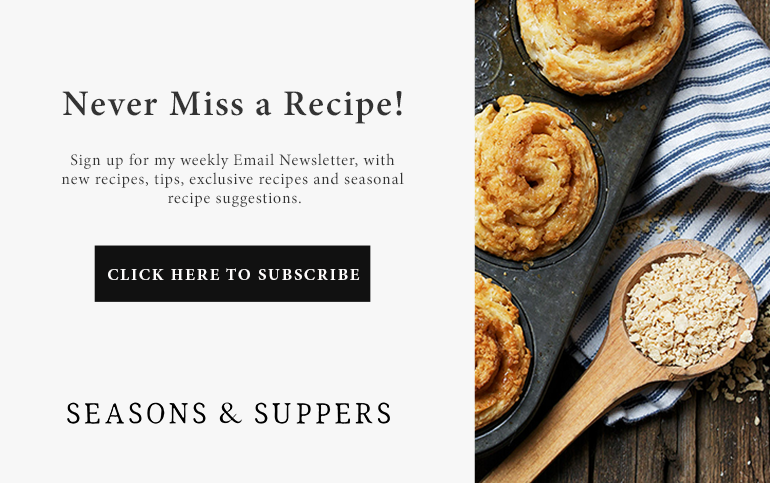 Sometimes your recipes literally leave me speechless. Thank goodness I can type ;) Stunning photography as always! Thanks so much, Robyn and yes, that French toast was soooo good! 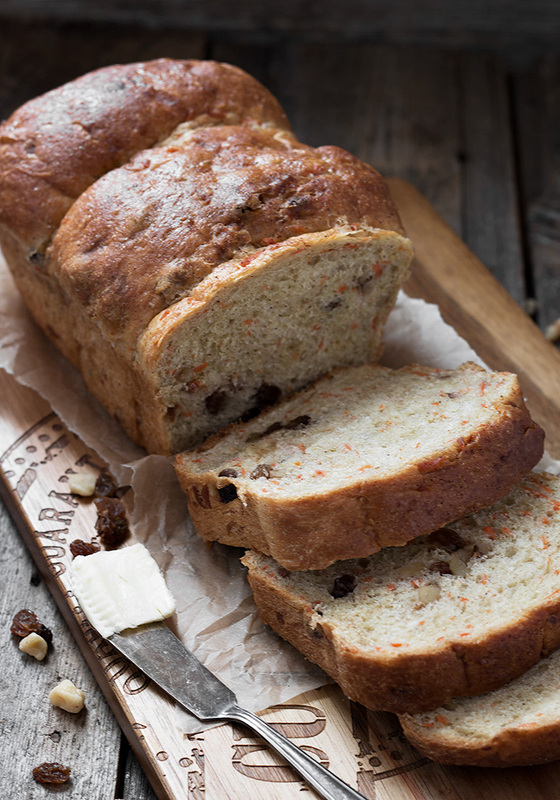 You had me at cinnamon raisin bread meets carrot cake… this is perfection! Jennifer you are just KILLING IT! I absolutely LOOOOOVE both cinnamon raisin bread and carrot cake, so I am seriously swooning over the fact that you combined those two into ONE. I bet this tastes incredible! And turning this bread into french toast?! I am SO doing that!!! YES! Cheers, girlfriend! Thanks so much, Cheyanne :) Loved this bread! This bread looks wonderful Jennifer! That photo of the french toast…OMGee! Me too, Lisa :) Thanks! French Toast ~ Easter morning ~ YUM! Three for the price of one today! You always spoil your readers – but this is one for the record books! I can’t handle the flavors going on here! Or the stunning photography! I’m hungry!! Thanks Annie :) I’d have a hard time picking my favourite way to enjoy this bread! This love child is one gorgeous loaf! My mind is racing around from just eating it plain, to toasted with butter, then as French toast. We could devour this loaf in one day – it looks so delicious! Thanks so much, Tricia. I have to say, this bread was great all ways! Cinnamon Raisin bread is hugely popular around here, but I’ve never had anything like this one before! 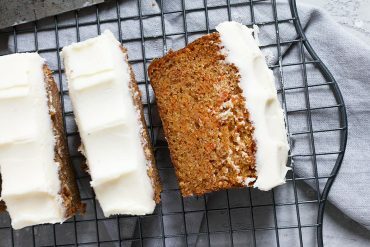 It’s like carrot cake meets bread! How good does this look?! I can only imagine the French toast with this baby – what a delicious weekend brunch this would make with a nice side of crispy bacon…and coffee ;) Pinned! Thanks Dawn and yes, it really is carrot cake meets bread :) And the French Toast was awesome! !